Christmas 2009 started with a wonderful Christmas Eve dinner. Rudy and Roma came over to hang out with us. . .us being mostly Abigail. :) Zach, Abby and I also took goodies to our neighbors which was really fun. . .something I hope we do for years to come. Presents are wrapped and under the tree and the most important gift for us this year--our beautiful baby girl front and center. The house looked so cozy. . . Christmas Day we opened presents at home and then headed to Olympia to spend time with my family. 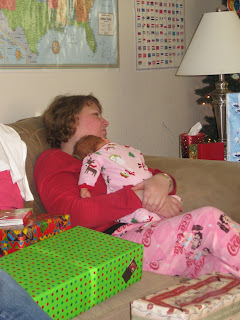 Abigail was quite spoiled. . .here she is with Aunt Michelle. 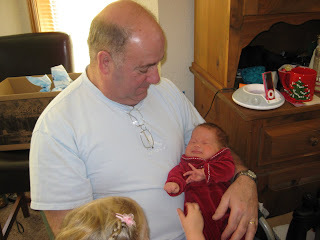 . . And then Grampy. 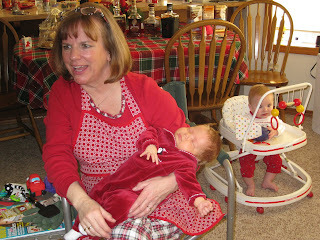 . . And a lot of the time with Grammy who always has a reason why she should be holding her. Oh hey Griff. 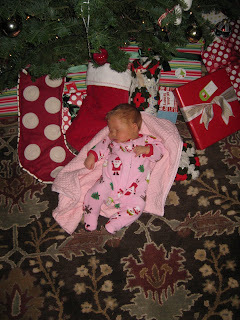 :) Abby got so excited about Christmas that she pooped this outfit out part way through the day--Lovely! 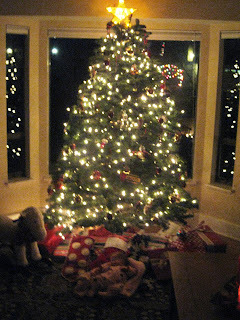 Another Christmas come and gone--it is always so crazy when the day is over because you wait for it for so long. Merry Christmas everyone!! Every morning I have Zach feed Abigail so I can start my day. . .when she is done eating this is usually what happens next. 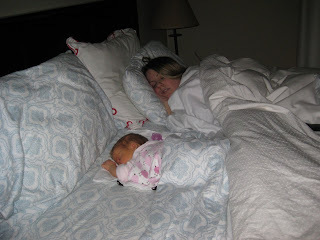 . .
Then Dad has to also get up to start his day too so our little princess takes over the bed all by herself. She just sprawls all out and loves it. I mean she has her arms all spread out like she's showing everyone that it's all hers--no room for anyone else. . .hmmnn. Update for Leah. 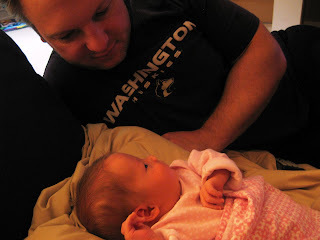 . .
Leah requested an update to hold her over til she headed out to WA so here goes. . .
Little Miss Sophia all dressed up and ready to see the Rockettes. She told us that they like to kick as she kicks her leg in the air. She had a little hat to match the dress. It was adorable and she loved the performance. Maybe someday she'll be a Rockette! Abs and I in front of the tree in our private dining room. 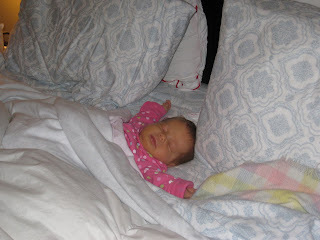 A cute pick of the little one as I was changing her diaper. . .in the private dining room we were in. . .I kept it clean and no one saw. 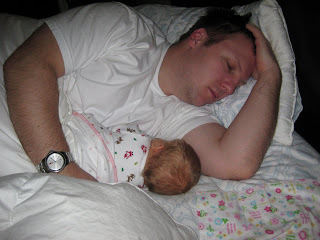 :) This is how Zach found us when he came to bed the other night. . .both just zonked out. Abby loves our bed and loves to lay on her tum. . .which we only let her do when we are very near. 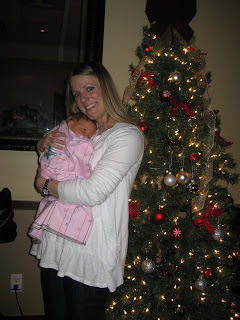 Last night she made an appearance to her first Christmas Party at Tom and Terri's. She did great and we stayed out til almost midnight--LOOOONNGGG night for us but we hung pretty good. 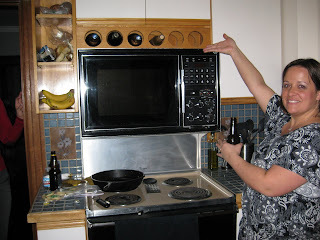 Had to put this pic in--this is Tom & Terri's microwave. . .look at how large it is and check out the dials--WOW. . .I am impressed it still works. 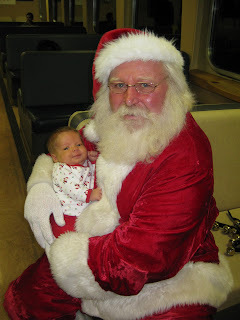 On the way to the party we came from Vashon Island so Abby experienced her first ferry ride. . .and SANTA!! We were so excited. I think Abs got so excited that she pooped herself silly. When I went to change her before getting back in the car I had quite a surprise. Poop everywhere! Thankfully I had an extra outfit but I was worried that we wouldn't get cleaned up in time to get back to our car before the boat docked since it isn't a very long ride. . .we made it just in the nick of time. Today we celebrated the Wyckoff family Christmas at Great Grandma Joye's house on Magnolia. We had a wonderful time but I didn't get much sleep last night due to some blocked milk ducts which equals serious PAIN so now we are home relaxing. . .our original plan was to shop downtown Seattle but I think we'll have to save that for another day. I'm off to take a little nappy now. . .
Christmas in Woodinville. . . 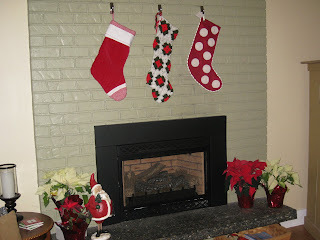 The stockings were hung by the chimney with care in hopes that Saint Nicholas soon would be there. 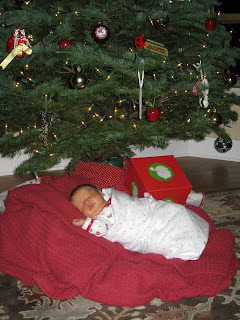 . .
We finally got our tree on Friday after Abby's weight check doc appointment. She is weighing in at 9lbs. 2oz. at 5 weeks old!! 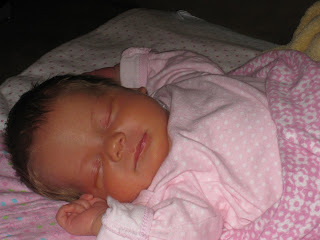 Such a big girl and I love it--every time I change her diaper I just want to kiss her little leggers--they're so cute. On Sunday Abs and I went shopping a little for Daddy's Christmas gifts. 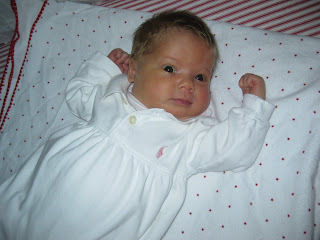 She got all dressed up in her Ralph Lauren outfit courtesy of Bird. It is a 0-3 month size and it fit perfectly. . .she had a cute little pink jacket that she snuggled in while we were walking around Woody. Everyone thinks she is so cute--DUH--she is!!! Zach and Abby sat upstairs with me for awhile while I decorated the Christmas tree but then Z went downstairs while I finished everything else. When I was all done I turned out all the lights except for the tree and Nativity and had him come up to see our beautiful Christmas decorations. It was so magical. It just seemed right to take pics under the tree so here we are. 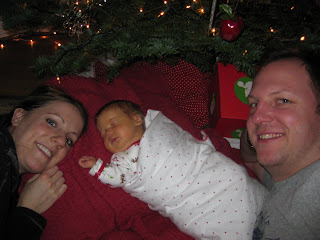 :) Our first Christmas as a family. . .it's so wonderful!!! 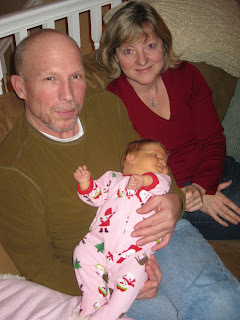 The only gift we want for Christmas this year--a healthy, happy baby and here she is. The tree looks awesome in our front window. 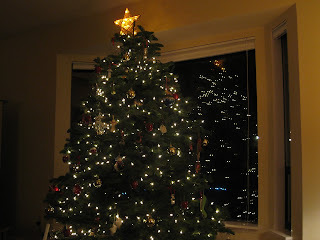 I love that we have a home with lights and a tree--I feel like such a grown up. :) Uhh, this has nothing to do with Christmas in Woodinville but it's how we spend a lot of our time right now. :) If you click on the pic to enlarge it you'll notice that Abby was sweating. So we got a little too snuggly--oops. The due date has arrived. . . I can't imagine being pregers still and having little (or should I say BIG) Abigail in me still. Although I'd probably be warmer during this cold weather. :) Abs is definitely still growing generously as you can see with those cheeks in the pics below. 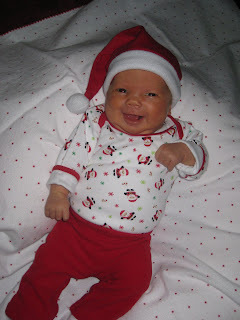 The cute tee and Santa hat are from Uncle Richie. . .they are perfect for our Christmas Miracle. 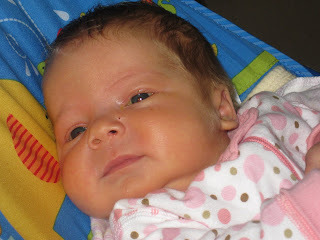 Tomorrow we go to the doc for a weight check--can't wait to see what Abigail is weighing in at now. 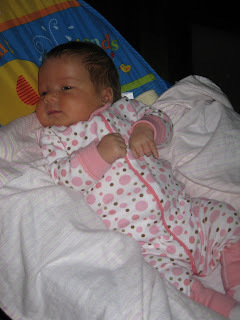 She feels a lot bigger to me and is filling out her newborn clothes perfectly--my little chunk o munk. 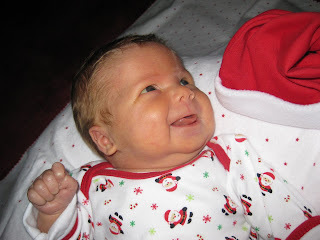 Our little Christmas elf just giggling away. 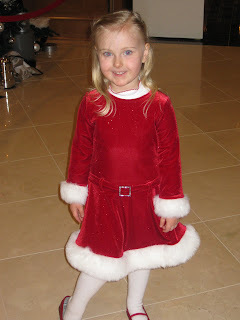 I think she is definitely on Santa's "Nice" list. . .well most of the time. :) Cheeks and more cheeks. Love it. Love this outfit from Jenny Vanderbeek. So cute! Abby went on another outing to the dentist with me so I could get my root canal. 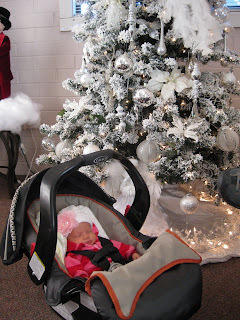 Her Dad came up this time and hung out with her in the waiting room by the Christmas tree. She slept the entire time. . .Aunt Helen and Lindsey got her that cute hat w/ the flower--looks like a little present under the tree. 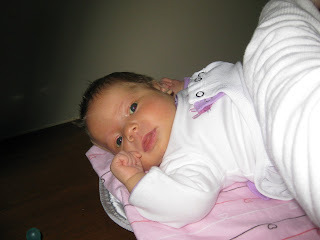 Abby turned 1 month old yesterday! 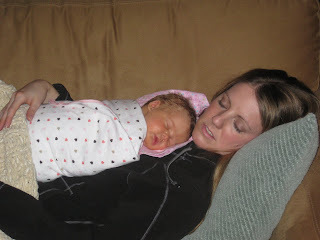 I can't believe she has been with us for a month now and I still haven't hit my actual due date--HA We didn't do much for her birthday. . .She sat in her vibrating chair from Danielle, we stared at each other and of course she, ate, slept and pooped. We were going to get our Christmas tree yesterday but had a few home projects that needed to get done first so we'll be getting that this week. I can't wait to decorate. In this past month Abby has really grown. 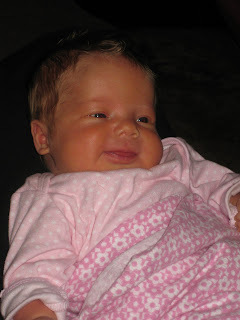 She seems to smile more and she definitely keeps her eyes open much more which is great. She is VERY on schedule, literally waking up to eat every 3 hours--not a minute later. . .which I'd like if she went a little longer at times but I guess all in due time. 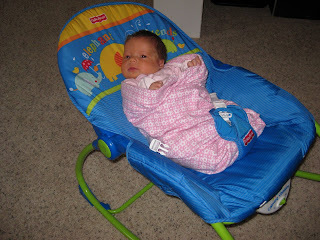 This vibrating chair is Abby's new favorite thing--we put her in it and she is out like a light in no time!! 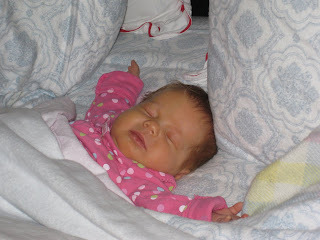 I love pics of Abigail sleeping--especially if it is in the middle of night!! This is during the day though, hmmn. Her cheeks are so chunk and her little leggers are my favorite thing!! 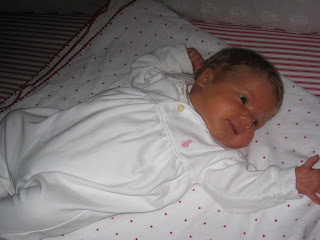 Hello my sweet little baby girl--Happy Birthday!. . . Oh hi Dad, I didn't know you were back there. :) They love staring at each other. All dressed! 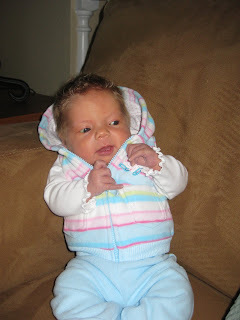 It kinda looks like she is getting ready to box. . .jab, uppercut. 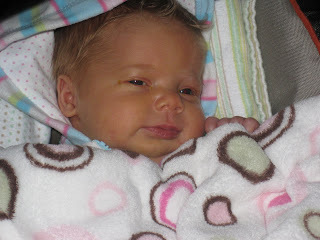 All snuggled in her car seat which was attached to her new stroller. Zach and I finished putting the stroller together yesterday in preparation for our big outing. I was worried I was going to feel like it was too big but I LOVE it! It drives so smoothly and is so easy to set up and close. It was great. Here we are on Candy Cane Lane in Bellevue. Book Club was great. 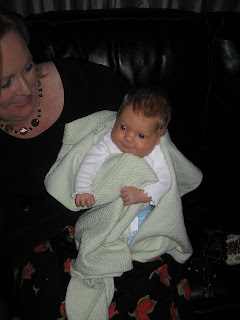 We hardly talked about the book as there was so much to catch up on--babies, engagements, trips, etc. I love my BC gals and I think Abs does as well. Pretty much everyone got to hold her and love her. :) It was my first time having to change her diaper in a public restroom. 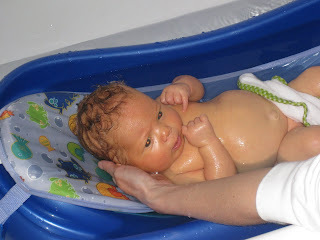 I was a bit worried about the cleanliness but it wasn't bad at all! 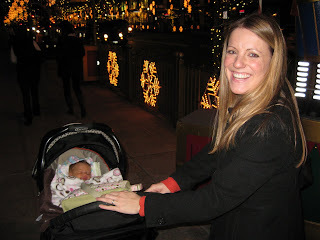 These outings are just getting easier and easier. . .especially now that I have my awesome City Mini stroller! !